If you've ever found the need to edit a text file on your website, you know how much of a pain it is to find the file, view it, save it, edit it, and then upload it. Not only is this process very time consuming, it also leaves room for a lot of mistakes, and one simple mistake makes for a very large headache. To start using EZ-TextEditor, login to your member tools and then click on the Construction Tools tab. You'll see the link to start EZ-TextEditor in the bottom-right corner of the page. In the top-left corner of EZ-TextEditor interface is a simple tool bar. To save the changes you have made as a new file with a different filename, use the Save As icon: . 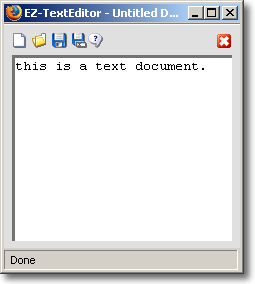 You can also access EZ-TextEditor from within EZ-FileManager. This is particularly useful if you would like to work on multiple text files in one sitting. In EZ-FileManager, you'll see a list of all your files. To the right of each text file is an edit icon: . Click on this icon to open that file in EZ-TextEditor. To protect you from losing your data due to computer crashes and power outages, EZ-TextEditor has an automatic backup feature included in it. While you're working on your file, a backup will be saved periodically. Then if your computer crashes, you can come back and recover the changes that you had made. EZ-TextEditor will backup your current changes every 10 minutes, so you will never lose more than 10 minutes worth of work on your website. Like EZ-PageBuilder, you need to exit properly when you're done working on your file. In EZ-TextEditor, this is done by clicking on the button. Exiting Properly ensures that your document is saved properly before you exit EZ-TextEditor. If you don't exit properly, you run the risk of losing some or all of your work. © Copyright 2015 ICServ, Inc. All Rights Reserved.